This year India was the host for the celebration of the World Environment Day (WED). The theme of the WED was Beat Plastic Pollution. Ministry of Environment & Forests & Climate Change (MoEFCC) was in charge. The WED celebrations were held all over the country and a 4-day conclave was organized in the Vigyan Bhavan in Delhi with an exhibition. I bumped into the Mr. Nitin Gadkari, Union Minister for Road Transport & Highways during a lunch at the India International Centre. The Minister greeted me and asked “ Dr Modak, how come in Delhi?”. I told the Minister that I was there to speak at a panel discussion organized by MoEFCC on WED. I also told him that I have to congratulate the MoEFCC for effectively spending 350 million Indian Rs on WED in just 4 days! What a splendid performance of spending” I said. Of course, to Mr. Gadkari, such an expenditure was peanuts compared to the billions of Rs that his Ministry is spending on surface transport, essentially building roads. In October 2017, the Indian government announced an investment of 6.9 trillion rupees ($11 billion) to build 83,677km of roads over the next five years. So, the Minister just smirked on my appreciation of MoEFCC. I was surprised. All I knew was building good roads was necessary for the ruling party but if built without sensitivity and responsibility then the roads could adversely impact environment and the people. I later learnt that plastic waste in asphalting can include anything from sweet wrappers to shopping bags except Poly Vinyl Chloride (PVC). The mix reduces the quantity of bitumen required by 10 per cent. Further, the Plastic roads were found to be stronger and maintenance-free. These roads could last about three times compared to the conventional road structures. “All good” I said to myself “Then we should generate more plastic waste to reap all these benefits”. In November 2015, the Indian government made it mandatory to use waste plastic in building most highways. According to this directive, road developers have to use waste plastic along with hot mixes for constructing bitumen roads within 50 km of periphery of any city that has a population of over 500,000. However, in recently released guidelines for developers, when waste plastic is not available, then the developer has to seek the road transport & highways ministry’s approval for constructing only bitumen roads. “But Dr Modak, we insist on the use of plastic waste in making roads” said the Minister. Minister said that using recycled plastic to build roads not only curbs plastic pollution but also creates jobs. The waste pickers collect the plastic litter. This plastic is shredded in machines which are subsidised by the Government. The waste pickers that mostly consist women sell the shredded plastic to the road builders. Tamil Nadu was the first State in India to actively develop a cottage industry around shredded plastic. “Thus, job creation for waste pickers and business to small entrepreneurs is an added benefit of building plastic roads – You know very well – generating employment is the current focus of our Prime Minister” Mr Gadkari said. He was absolutely right. I thought of checking the “downside” of plastic roads. I understood the concern about PVC. Thermal degradation of PVC results in the emissions of harmful gases (like hydrochloride acid). Unfortunately, PVC is virtually indistinguishable from other plastics. Further, heating PP, PS or PE plastics is also not that safe. Studies reveal that heating PP, PE and PS releases moderate to highly toxic emissions consisting carbon monoxide, acrolein, formic acid, acetone, formaldehyde, acetaldehyde, toluene and ethylbenzene. Workers engaged in road-laying are particularly at risk from these emissions. But in Prof Vasudevan’s technology, shredded plastic is melted with low heat to avoid such emissions. However there could be unforeseen risks. If the plastic roads get old or are poorly built, then such roads can “leak” plastic fragments into the soil and eventually into waterways as a result of photodegradation. The plastic fragments break down when exposed to environmental factors such as light and heat. These minute (less than 5 mm) plastic particles are called as microplastics. Remember, that plastics are not merely molecules of carbon and hydrogen. To convert them into daily-use products, chemical additives are added to give them flexibility (softeners and plasticisers), to delay degradation due to heat or sunlight (stabilisers and anti-oxidants), to give them colour, to make them fire proof (flame retardants), to give them body (fillers). The toxicity of most of these chemicals is not known. But the few chemicals that have been studied – like phthalates – a category of chemicals used as softeners, or brominated flame retardants are highly toxic. They can cause birth defects and cancer, and hormonal problems particularly for women. Because they persist in the environment and can build up in the food chain, even seemingly insignificant amounts in the environment can grow to deadly levels in our bodies or in the food we eat. So, the microplastic is certainly not that innocent. In the past few years, scientists have found microplastics in our soil, tap water (even bottled water), food and even in the air we breathe. And there’s growing concern about the potential health risks they pose to humans, animals and the fish. 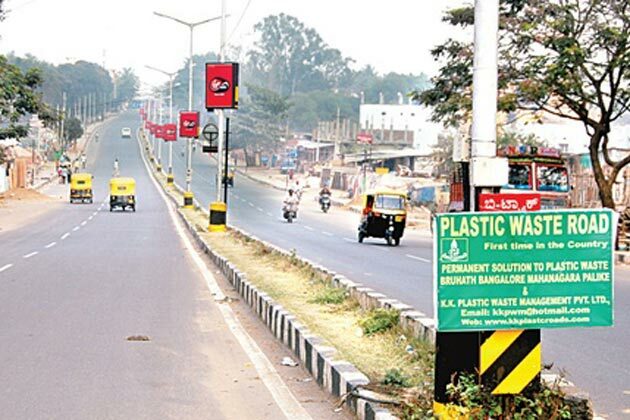 Burying plastic in roads may not be therefore a solution over long run. Plastic in roads is merely hiding and perhaps ready to escape as microplastic at some stage of the life cycle. But if at all this happens then we don’t know when. Ignorance on this potent risk can be a bliss. We certainly need more long term and/or field simulated research studies. But then what is the alternative? Doing nothing could perhaps be more harmful. One possibility could be to develop plastic-wood (saw dust) composites for the railway sleepers. I was aware of the railway sleepers recently made by Advanced Plastic Recycling in Adelaide, Australia using blend of melted HDPE and the saw dust. This option may be pursued as the scale of application is big to “gobble” the waste plastic in a secured manner. Of course the priority should be to reduce plastic waste at the source in the first place, but I wasn’t sure how effective would our bans on plastic be given the challenge of behavior change. I said “Thank you Sir and goodbye” to the Minister. As a kind gesture, Minister asked his Senior Adviser to reach me to the lobby. I hardly heard him. I was lost in my own thoughts on this apparent plastic paradox. Every day, nearly 4,000 shipping containers full of recyclables leave US ports bound for China. China sends to the US toys, clothes and electronics, In return, some of America’s largest exports to China are paper, plastic and aluminium. From January 1 of this year China is enforcing its new “National Sword” policy, that is considered as the “Green Fence”. It bans 24 types of solid waste, including various plastics and unsorted mixed papers, and sets a much tougher standard for contamination levels. China is essentially saying that the country would no longer serve as the world’s trash dump. The ban will undoubtedly hurt recycling operators in China that rely on the import of raw materials such as recyclable waste. But it appears that delivering a cleaner China is perhaps paramount to the politicians of the Communist Party. What is going to be India’s take? Do you think India too should “Green Fence” and pull out its Sword? Yes, India should also develope that fence as we already have enough such waste generated in our land which will suffice our own recycling industries and generate livelihood. I agree with you sir. However, I believe prohibition of any kind do not work without proper implementation and as we know, we lack in implementation. Alternatives to plastic and alternative habits are the need of the day. Sadly, that is not the focus of society as a whole including government agencies. Easy and fancy ideas are floating without considering the long term implications.